Sepsis is defined as a life-threatening organ dysfunction caused by a dysregulated host response to infection. Septic shock is a subset of sepsis in which underlying circulatory and cellular/metabolic abnormalities are profound enough to substantially increase mortality. During the course of sepsis, circulating endotoxin levels can increase up to 1000-fold. Several studies have demonstrated that high endotoxin levels correlate with a higher mortality in sepsis and septic shock. The recent new sepsis definitions (published in JAMA, February 2016) describe septic shock as a pathologic condition with a mortality risk of more than 40%. 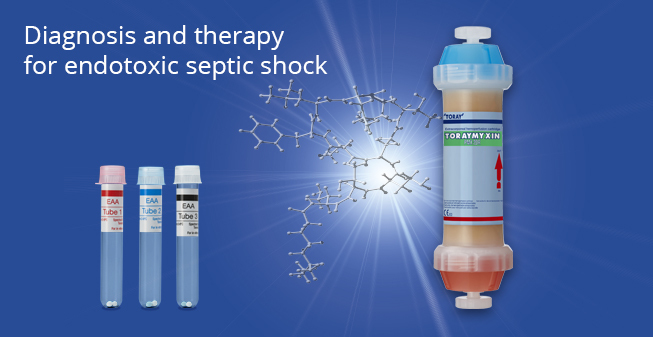 Toraymyxin® – Polymyxin B hemoperfusion therapy – (Toray Industries Ltd., Japan) is the state-of-the-art therapy for the treatment of patients with endotoxic septic shock who are unresponsive to conventional treatment. More than 150,000 patients have been treated with this innovative therapy and more than 250 peer-reviewed articles have been published demonstrating the safety and effectiveness of Polymyxin B hemoperfusion therapy. EAA™ – Endotoxin Activity Assay – (Spectral Medical Inc., Canada) is the only FDA approved and CE marked rapid diagnostic assay to detect endotoxin activity in human whole blood. The EAA™ diagnostic test is performed in less than 30 minutes. Blood purification therapies in intensive care units must be supported by safe and reliable systems. We propose EstorFlow® as a safe hemoperfusion system and easy-to-use for healthcare professionals.